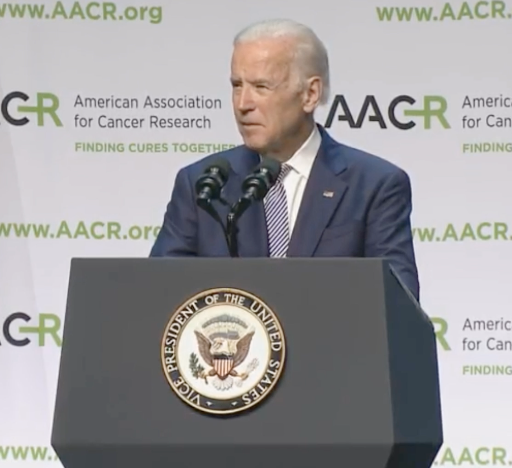 Vice President Joe Biden said that improved data sharing, recruiting more patients into clinical trials, and streamlining the research grants process are needed to win the war on cancer. Vice President Joe Biden said that improved data sharing by making publications more readily available, recruiting more patients into clinical trials, streamlining the cancer research grant process, and incentivizing verification studies are needed to ultimately win the war on cancer. His speech was delivered and broadcasted live during the closing plenary session of the American Association for Cancer Research (AACR) Annual Meeting 2016 in New Orleans, LA. “My job and my commitment are to bring together all of the human, financial, and knowledge resources we have in the world to seize this moment—to make a quantum leap, to make a decade’s worth of progress in 5 years,” Biden said. The National Cancer Moonshot Initiative, which was initiated by President Barack Obama in early 2016 and is led by Biden, seeks to make more therapies available to more patients, while simultaneously improving cancer prevention and early detection. He said the first thing he had to do in order to accomplish this was to coordinate the federal government’s efforts with the private sector. “I made a commitment that…I will eliminate the barriers that get in your way, that get in the way of science, research, and development,” he said. Biden discussed what he believed to be the greatest barriers to cancer research. He said the problem is not limited to lack of funding. Another barrier the Vice President discussed is the lack of timeliness for approving federal research grants. “It seems to me, we slow down our best young minds by making them spends years and years in the lab before they can get their own grants, and when they do, a third of their time is spent writing the grant that takes months to be approved and awarded,” he said. Biden also told the attendees that President Obama and he were able to work with the United States Congress to increase the funding for the National Institutes of Health National Cancer Institute by $2 billion in 2016. In 2017, Biden hopes to receive an additional $800 million for the fight against cancer. If approved, $75 million will go to the U.S. Food and Drug Administration to fund a Virtual Oncology Center of Excellence, and more than $600 million is slated for the National Cancer Institute for research priorities, such as enhanced early detection technology, cancer vaccine development, cancer immunotherapy and combination therapy, genomic analysis in tumors and surrounding cells, enhanced data sharing, and pediatric cancer research.